These short pieces are not really intended for future full-scale productions, mostly because the quality of the pieces varies within the show and because there is no guarantee anybody will want to pick up the whole lot of them, but they do show up in anthologies fairly often. 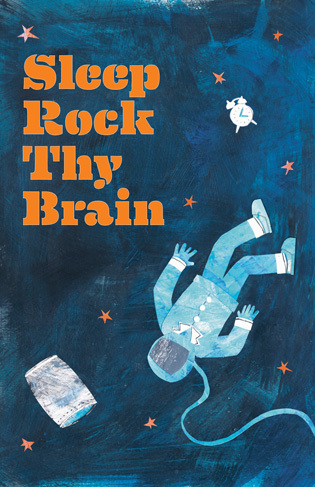 This year's Sleep Rock Thy Brain featured longer pieces -- maybe a half hour each -- giving playwrights Rinne Groth, Lucas Hnath and Anne Washburn the chance to more fully develop their ideas than in Apprentice Showcases of the past. Each play in Sleep Rock explored the notion of sleep and sleeplessness along with aerial acrobatics choreographed by Brian Owens and ZFX Flying Effects. The idea -- combining sleep with flying -- was conceived by Actors Theatre's Amy Attaway, associate director of the Apprentice/Intern Company, and dramaturg Sarah Lunnie. And even though all three playwrights visited the University of Louisville's sleep center to get ideas about the science of sleep, each playwright interpreted that notion very differently. When Sleep Rock Thy Brain played as part of the 2013 Humana Festival, it was performed at Louisville's Lincoln Performing Arts School, an elementary school with a huge, open black box space big enough for all the rigging and machinery necessary to fly the apprentices. Future prospects for the show are likely to depend on whether anybody else has that kind of space and access to flying equipment. But if they've put on Peter Pan or gone for flying monkeys in The Wizard of Oz, a flying angel in Angels in America, or any kind of Cirque du Soleil, harnesses and actors in flight ought to be doable. The third piece in the Sleep Rock program, Lucas Hnath's nightnight, definitely deserves an afterlife. This look at what happens to a trio of astronauts when one can't sleep was riveting, scary and heavily dramatic, all at once, with Hnath's idiosyncratic dialogue and carefully crafted rhythms revealing a great deal about the relationship between humankind and science and humankind and sleep. Hnath's script integrated the aerial technology, used to show the astronauts in zero gravity, beautifully, while the actors ramped up the emotional tension as they navigated the tricky vocal patterns in the script. Jeff White was especially strong as the astronaut with insomnia, but his colleagues in space, played by Samantha Beach and Ethan Dubin, and at Mission Control, with Laura Engels, Kim Fischer, Chalia La Tour, Liz Ramos, Andy Reinhardt, Ben Vigus and Christa Wroblewski, were also impressive as they kept up the pace of this fractured, intricate, affecting text. I also enjoyed Rinne Groth's Comfort Inn, about a nice young woman named Sylvie, sweetly played by Madison Welterlen, who works at a somewhat unorthodox sleep clinic run inside a hotel. As Sylvie's evening gets continually crazier, with three oddball patients (Chalia La Tour, Andy Reinhardt and Ben Vigus, all quite good), co-workers and an entire wedding party converging on the clinic, we wonder what's real and what's inside Sylvie's REM cycle. Comfort Inn was fun, if somewhat chaotic and confusing. Dreamerwake, Anne Washburn's take on the sleep/flying intersection, combined bits of both Comfort Inn and nightnight, as Washburn went behind the scenes of the entire enterprise, placing her action inside the Apprentice Company as they rehearsed. She centered on a guy named Nick (Joseph Metcalfe) as he struggled with recurring nightmares about an aerial mishap involving his friend Lou (Derek Nelson). The use of darkness and shadow and haphazard plotting certainly approximated dreaming, but in the end, Dreamerwake seemed obvious and forced, like a lesser episode of The Twilight Zone where you can see the end coming a mile away. All in all, Sleep Rock Thy Brain made for a nifty Apprentice Showcase with one standout piece that lingers in my mind. Here's hoping nightnight, at least, finds a life after Louisville.